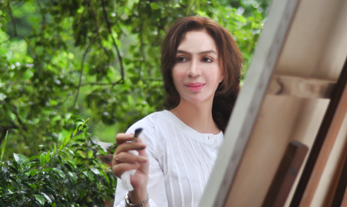 Communication creativity is Tehmina's natural talent rather a trait. Though there was no formal training brushing-up her artistic skills, but the excellence of communication, expression and translation of feelings on canvass speaks of the creativity of a highly imaginative mind. As an artist Tehmina's work is fascinatingly dynamic as she brings out the true expression be it a natural scenery, an emotional reality, expression of love, fear of losing, anticipation of achieving, pain felt, desires unmet, tears unseen, spirituality experienced, mysticism unexplored, darkness sensed, embrace untouched, & all of that you can envision or not imagine. Catharsis - the first art exhibition positioned Tehmina Durrani as a grand master creating masterpieces reflecting the oppressed women. The thematic paintings depicted the society where the women are being exploited. 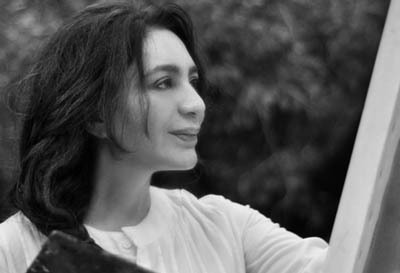 In Tehmina's words, "I found it impossible to paint about things that did not touch me deeply. I also found it impossible to paint men". However, in all probability, it is a man who touched her so deeply; that she wrote a book and painted so many 'pains' - all because someone had touched her deeply though negatively. did not touch me deeply. I also found it impossible to paint men". "The thirty-eight water colours that illustrate the story as authentically as was possible for me, were done in Kandahar, Turkham & Chaman..."
"Many forms of expression are required to break out of the multiple confines that imprison the soul. Writing and Painting are just two of them."